This is the 180th edition of the Epileptic Gibbon podcast music show and the playlist to accompany it. CLICK HERE TO LISTEN. The show is also available via Mixcloud here and the Progzilla Radio Network (the show is now appearing on Progzilla in alternate weeks). 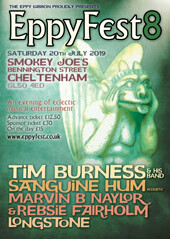 Taking a break from my seemingly never-ending review of 2015 and following my preview last time of EppyFest 5 this time we welcome three members of the excellent Sanguine Hum into the Eppy Gibbon studio. Our feature album is the new/old album by Sanguine Hum, ‘What We Ask Is Where We Begin’. The guys from the band will talk about the fascinating evolution of this album, which is finally released on CD for the first time. We’ll also cover the usual diverse selection of styles and genres, this time chosen by me and my special guests. Below you’ll find the track list, plus weblinks from where you can find more information about each artist. Total running time: 1 hour & 54 minutes. Downloaded file is 104.39 MB. Thanks to all the musicians who contributed, especially Matt, Brad & Joff for coming into the Eppy Gibbon studio, and to all listeners. Send us comments if you like what you hear (or even if you don’t… feedback is so important!). If you want to keep up to date with news about the show, EppyFest, or just chat with other listeners, don’t forget that there’s a Facebook group – just search for the Eppy Gibbon Podcast Show on Facebook and request to join, plus don’t forget that we’re now part of the Progzilla Radio Network. Despite what I say at the end of this show, I may not be back next time – hopefully Rebsie & Daniel from Alchymical Muse will be sitting in for me, but either way I hope you’ll join us for the next edition. This entry was tagged Alternative rock, Art pop, Art rock, Canterbury, Electronica, Eppy Gibbon podcast show, EppyFest, Folktronica, Jazz, Post rock, Prog rock, Sanguine Hum, TV themes. Enter your email address to subscribe to this blog and receive notifications of new episodes by email.